We observed content creators and platforms in the headlines, watched the trickle-down effects to advertisers regarding brand safety, and ultimately witnessed a shift into more strict restrictions on the media industry as a whole. At the same time, demand for influencer marketing grew exponentially. On a lighter note, 2017 was a watershed moment for content creators using their influence to openly express support and awareness for social movements and philanthropic causes. These included the Somalia hunger crisis campaign, natural disaster charitable drives for Houston, Puerto Rico, and Mexico, not to mention responding to tragedies such as the Las Vegas mass shooting. Those campaigns built on initiatives from recent years, like the “Ice Bucket Challenge” for ALS. Over the past three years, influencer marketing has gained traction and evolved into a media spend component that companies are compelled to support. It has been a steep learning curve, with agencies and brands initially having little or no knowledge of best practices in utilizing talent platforms effectively or how to comply with FTC/legal disclosure requirements, not to mention how to measure ROI. For some it remains a mystery how to generate mass viewership, conversions, engagement, awareness, or raise brand sentiment. With advertisers and brands striving to establish their footprint in the “new space,” there was an influx of marketing budgets being allocated toward a media component that was undeniably unfamiliar territory. From a brand/advertiser perspective, a media strategy that did not include a significant investment in influencer marketing ran the risk of being labeled as “antiquated.” It would also mean foregoing the opportunity to connect with that coveted potential mass consumer base, a.k.a. millennials. It would be a lost opportunity to capture learnings surrounding their audience profiles and behavior. Influencer marketing as a new media placement option benefited large and small companies alike, providing a relatively low cost-of-entry and turn-key alternative to the traditional offerings of TV, Radio, Print, Display, and Out of Home options. These options usually required a minimum spend (budget) associated with them, in addition to lead time for creative ideation, production, client approval, and distribution. Companies quickly realized that digital brand endorsements or social engagement from a celebrity could result in product “falling off the shelves,” or turn a video into an overnight viral sensation. In traditional television, we’ve witnessed Oprah Winfrey exhibit this phenomenon when she would mention a particular type of tweezer on her daytime show, which later evolved into her annual “Oprah’s Favorite Things” episodes, and resulted in certain brands receiving a spike in demand for featured products. 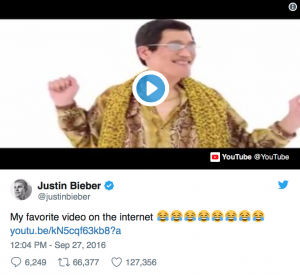 The influence of digital celebrity endorsement was more recently reinforced by the PPAP (Pen-Pineapple-Apple-Pen) video that was made popular by Justin Bieber, who shared his favorite video to his 88 million Twitter followers. The video has garnered over 15 million views to date, and has transformed the PPAP guy (DJ Piko-Taro, aka Japanese entertainer Kazuhiko Kosaka) into a celebrity. He’s performed at venues around the world and made guest appearances on various television shows. 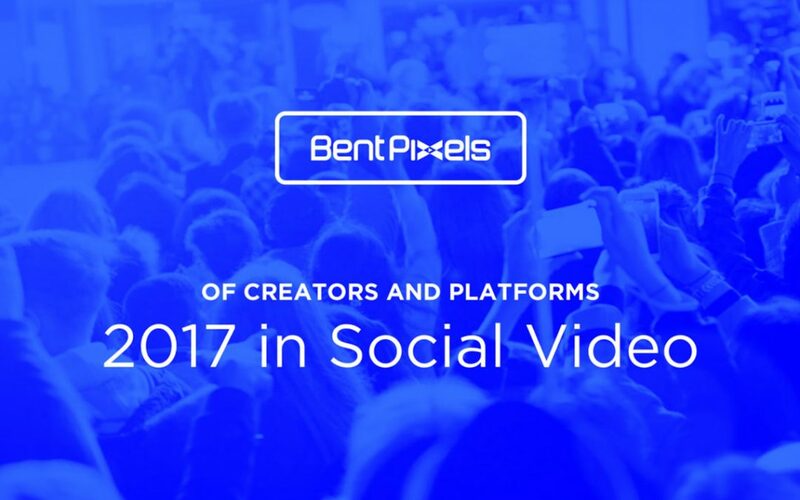 Whether you’re talking about celebrity influencers or digital-native creators who have developed spheres of influence, 2017 was a complicated year filled with growth, opportunity, and the effects of major consolidation. The changes are definitely a positive sign toward the future, indicating the business is reaching a milestone of maturity. Like the trajectory of network television, there were a handful of big players at first that were later acquired in a period of conglomeration. Initially when large media corporations realized the value of influencer marketing, they began to focus on acquiring talent networks for sizable price tags, realizing that it is easier and more cost-efficient to buy an existing entity, rather than spend the resources to build their own in-house divisions. In the past few years, AT&T and the Chernin Group’s Otter Media acquired Fullscreen, Disney bought Maker Studios, Comcast purchased Dreamworks Animation – which included AwesomenessTV/Big Frame (also partially owned by Verizon Hearst), and Warner Bros. invested a major stake in Machinima (later to become a full acquisition). By 2017, more shifts associated with conglomeration took place. The powerhouse previously known as Maker Studios and now known as Disney Digital Network was radically altered in size and purpose. In the fall, Fullscreen opted to close down their SVOD division by mid-January 2018. In early January 2017, one of the erstwhile social platforms learned the hard way how consolidation often works. In the saturated social media platform space, which includes Facebook, Twitter, Instagram, SnapChat and Pinterest, Vine saw its demise. It was evident that it would never become the everyday video sharing tool its founders had envisioned. Vine was essentially “Twitter for video,” was coincidentally acquired by Twitter, and eventually phased out due to low adoption rates in relation to the popular platforms of Instagram and SnapChat. In addition, the longevity of SnapChat may also be in question, as Facebook continues to encroach on its user base and services. On a separate front, this year some creators have pushed the boundaries of the online media space, raising the question as to whether specific content that can classified as edgy, mature, or even questionable, should be accessible or widely distributed for mass audiences to consume. This issue came to a head with what’s known as “Adpocalypse,” when in response to specific incidents YouTube demonetized a significant portion of videos on the platform. In addition to the monetary implications YouTube creators, who once praised the platform where you could gain instant fame and find an audience for just about anything, found that the rules had changed. As traditional television once did, YouTube is now moving toward a serious role in mainstream media as a big destination for advertisers. Accordingly, it’s taking greater responsibility for the content that is distributed through its platform. The importance of YouTube as a platform and the growing participation of major advertisers fundamentally alter an ecosystem that used to be known as the Wild West. We should expect that all other platforms will, or already have, adapted their policies to aligned with the digital giant. As humans are the ultimate problem solvers, we’re also uniquely qualified to create them as well. As the space has matured and has become saturated over the years, it can be challenging for both veterans and newcomers to the digital media environment to distinguish themselves and maintain their position in the race to accumulate views, subscribers, and followers. That ongoing challenge is part of the business we’re in. As a result of a wide spectrum of beneficial and controversial headlines in 2017, it’s accurate to say that it’s been a year of adjustment. As we’ve witnessed talent networks like ourselves grow, we’ve also seen some become consolidated and acquired, allowing niche and boutique shops to sprout and still others (like Bent Pixels) to keep building on established businesses and exploring new opportunities within the market. With the influx of content creators inundating the influencer space, we’ve seen growth in the quality and creativity of content. Last but not least, as digital media has evolved into a colossal mainstream communication platform for information, news, and the like, significant efforts are now being made in terms of accountability of distributed content. There’s much to be optimistic about as well. Freedom of expression and the existence of social media platforms like YouTube (a place to find an audience for just about anything) have created incredible opportunities in digital media. As humans we start with big ideas, create challenges around them, and then find solutions. The good news is that the growing pains, the media conglomeration, and the new rules are signs of the maturity of our industry. 2017 can be labeled as an important year. Boundaries were tested, and inevitably defined. I definitely look forward to what 2018 brings as we live and breathe in this ever-evolving space.